This sixth book in the Ludovic Travers series by Christopher Bush really hits its stride as a novel featuring the successful business author working on a case, albeit with the overall control of Superintendent Wharton and an invaluable contribution by Franklin. Originally published in 1931, this fast moving book presents riddles of music, recognition and international criminal activity. While Travers himself remains a little elusive, the mystery is a first class combination of unusual situations, clues and red herrings. Dean Street Press have reprinted another classic in this novel, and all lovers of solid, first class murder mysteries will enjoy reading this cleverly constructed book. Ludovic Travers literally bumps into Wharton travelling to investigate a probable suicide, and when he goes to observe the case, he finds that he recognises the corpse as an eccentric man he visited in response to a request for a discerning man. The strange tale of his visit slots into his explanation of the case so far, and Wharton is persuaded that there is far more to investigate than first appeared. 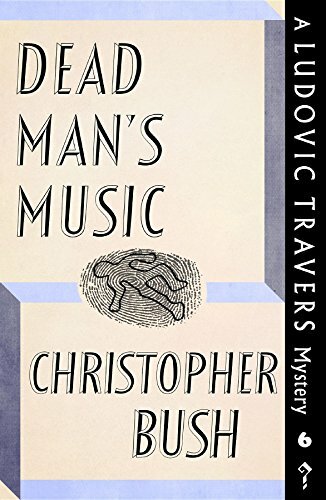 Claude Rook is recognised despite all attempts to disguise his body, and the music which Travers so enjoyed becomes a dominant theme in this novel. Some actual sheet music seems to represent something highly valuable, even if it seems to make no sense to the musicians consulted by Travers. The other mysterious character that Travers encounters and remains puzzled by is a housekeeper accorded far more privileges than usual to even a senior servant. Her silent communication may be an important clue, and her presence in another house raises even more questions. John Franklin’s involvement as usual involves risk and foreign travel; he seems to be the man of action compared with Travers’ flashes of inspiration. When combined with Wharton’s phenomenal memory for past cases, they are a formidable team and a fair result emerges. It is always possible to see the influences of other Detection Club members in Bush’s writing; the original encounter with Wharton’s vehicle is very reminiscent of Lord Peter Wimsey’s accident in “The Nine Tailors”, and it seems as these novels proceed Palmer the manservant is echoing the faithful Bunter. Not that the Travers novels are copying Sayers standard works; the plot and the crime remain far more central and Bush was apparently not so likely to get waylaid by social and other speculation. This is strong novel of complicated but enjoyable plotting with some unexpected twists and interesting characters. Even minor characters are well drawn and contribute to a satisfying whole. I truly enjoyed this book, provided as ever by Dean Street Press for review, and look forward to following Travers, Franklin and Wharton in the new cases just released. On Saturday I enjoyed a visit to Waterstones in Nottingham, where I spent far too long investigating the fiction section. Sadly two of the books on my list were unavailable, but I did get “Miss Boston and Miss Hargreaves” by Rachel Malik. It looks to be very interesting!